In early 20th-century, in St. Louis, Pearl Curran claimed to have conjured a long-dead New England puritan named Patience Worth through a Ouija board. 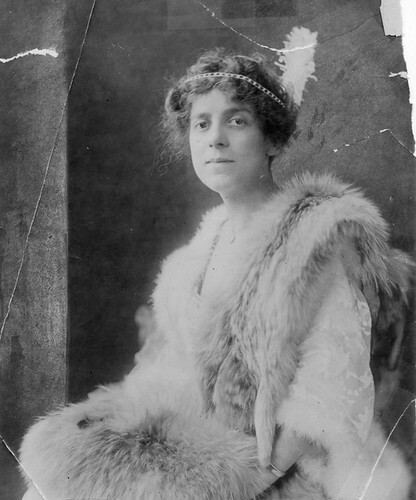 Although mostly unknown today, the resulting books, poems, and plays that Worth “dictated” to Curran earned great praise in their day. Ed Simon tells the story of the curious and nearly forgotten literary fruits of a “ghost” and her ghostwriter, and ponders their significance. … there is much literary merit in Curran’s work – so why then this neglect? The bizarre origin of the writings shouldn’t be an impediment to a reasoned study of their structural qualities. After all, William Butler Yeats attributed several of his lyrics to a spirit named Leo Africanus whom he encountered through the use of a Ouija board while a member of the Hermetic Order of the Golden Dawn. Without suggesting that the writings of Curran and Yeats are of similar artistic value, it would seem that dismissing them entirely on the grounds that there is a connection to the occult is unfair if a similar standard isn’t applied to Yeats. In both of these cases it might be helpful to think of the mediated personalities as being complex heteronyms of a type exemplified by the Portuguese modernist poet Fernando Pessoa (a contemporary of Curran and one also fascinated by automatic writing and the occult). A heteronym is a particularly complicated pen-name; in addition to a false name there is an entirely false identity, a fictional writer where literariness is extratextual to the poem or book itself. These concepts, of the heteronym and the muse, inspiration and authorship raise interesting questions about the epistemology and ontology of literature. Where does literature ultimately come from? What is legitimate as an object of reading and study? Can a literary hoax still be read as literature? Left: A spirit photograph of Yeats taken, according to Stanford University, during a seance in Paris around 1914 – Source. 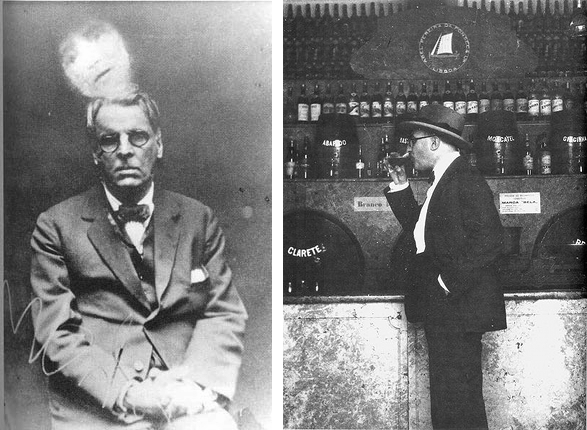 Right: Pessoa in 1929 taking a drink at Abel Pereira da Fonseca, Lisbon –Source. 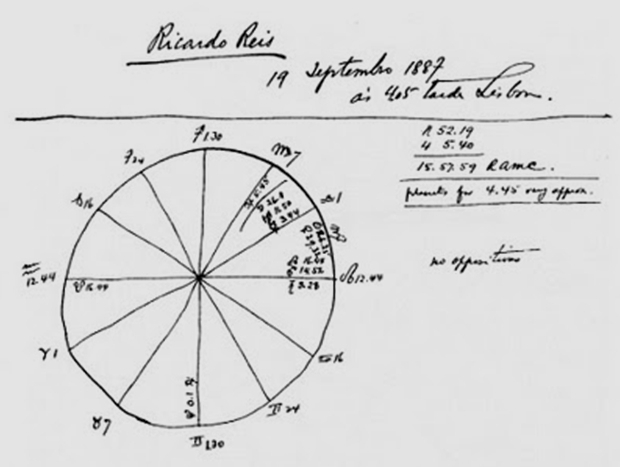 Astrological chart for Ricardo Reis, one of Pessoa’s heteronyms – Source. The Patience Worth case complicates questions of authorship. While it seems clear that Curran is the literal author, the fictionality surrounding the very productions of authorship helps to complicate our conceptions of creation and interpretation. Since the French philosopher Roland Barthe’s 1967 essay “The Death of the Author,” both formalists and historicists have become increasingly comfortable with the idea that authorship itself is a sort of fiction. Patience Worth/Pearl Curran makes this fictionality all the more obvious. As such, it seems that she is more than overdue for a critical rediscovery. In the long view of cultural history, her place becomes even more interesting. Biography and history become compressed and the relationship between who is a real person and who is a fictional person becomes more ontologically uncertain. I’m going to break any sort of pose of objectivity and say emphatically that I do not believe that Patience Worth was anything more than a full-bodied creation of Pearl Curran. It’s worth pointing out that there are no records of any actual Patience Worth having lived either in New England, or Dorsetshire where Curran claimed the poet was born. Yet, imagine someone reading Curran a millennium from now. Would such distinctions as whether Worth is “real” or not matter to this imagined reader? For classicists there are arguments about the “reality” of an author named Homer, ones that scholars working on much later periods don’t have to consider in the same way. Philosophically, if a heteronym’s words seem as full and real as an actual person, why can’t they be treated as such? The fullness of the fictionality of Patience Worth is that it is a fictionality which imposes itself on the real world, and that in itself is a fascinating act of literary creation. As we agonize over authenticity, we might recall that this was the date, in 1864, that Rev. 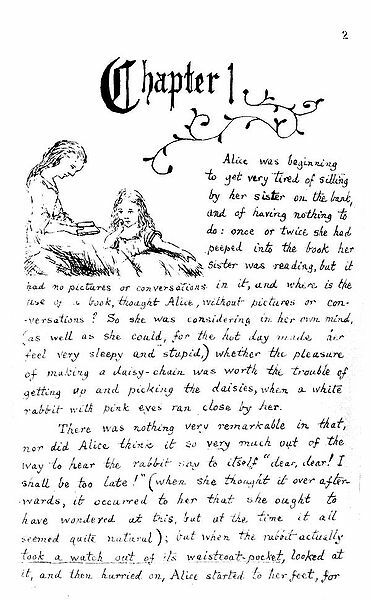 Charles Lutwidge Dodgson– aka Lewis Carroll– delivered a handwritten and illustrated manuscript called “Alice’s Adventures Under Ground” to 10-year-old Alice Liddell.